MEXICO CITY -- Economic uncertainty in the U.S. and bad press about safety in Mexico might be adding up to travel jitters for some Americans considering vacations south of the border, but the more than 100 industry participants gathered at the Marquis Reforma Hotel here on Oct. 7 for the eighth annual Travel Weekly Mexico City Leadership Forum were privy to a host of upbeat messages. In a keynote address, Mexico Tourism Board COO Rodolfo Lopez Negrete told attendees that the board was looking to completely reinvent and rebuild the Mexico brand while pushing the country into the uppermost tier of travel destinations in the world in the space of just a few years. Part of that effort is the board's $32 million, five-month "Mexico: The Place You Thought You Knew" marketing campaign currently under way in North America, which stresses unique cultural and natural attractions rather than traditional sun-and-sand destinations. According to Lopez Negrete, the goal is to simultaneously double arrivals and triple earnings, growing by double-digit percentages annually over the next eight years. The growth goal for 2010 alone is 20%. The tourism board is predicting total U.S. arrivals of about 4.4 million in 2010, compared with nearly 3.8 million last year and some 4.3 million in 2008. Currently, Mexico ranks 10th in number of visitor arrivals but only 20th in revenue generated. "That's not where we should be ... and it's unacceptable to us," he said. "We have a very specific goal in mind: We want to take Mexico into the top five [travel destinations] by 2018." To achieve this goal, the tourism board has delineated a nine-point plan of action, which includes moves such as increasing online promotion as well as product innovation, the diversification of source markets, and growing both airlift and the number of funding sources. The organization is also in the process of retaining new public relations representation in the U.S., said Lopez Negrete. The new public relations firm, not identified as of press time, will be charged with forming Mexico's first-ever crisis-management plan, to render the destination "less vulnerable" to negative coverage in U.S. media outlets. "We have to make a big shift: Instead of playing the victim as a country, we have to be a leader," he said. The positivity continued on the four travel agent and tour operator panels. 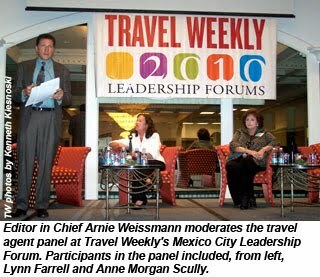 Sitting on the Forum's first-ever travel agent panel, "The Evolving Role of the Traditional Travel Agent in Selling Mexico," Lynn Farrell, president of Foremost Travel & Tours in Chicago, said that despite bad publicity, consumer worries and a negative economy, she continues to steer clients looking for value and quality in a vacation to Mexico. "We can send our clients to Mexico and know that in the end all will be well," she said. For her part, agent Anne Morgan Scully, president of McCabe World Travel in McLean, Va., put a positive spin on ongoing depressed hotel room rates for the Mexican suppliers in the room. "This crisis is an excellent opportunity to upsell my clients to a hotel product level that they're now getting used to at these reduced rates," she said, adding that they'd be more inclined to reserve those higher-end rooms later when rates rebound. During the "Challenges and Opportunities of Selling Mexico in Today's Environment" tour operator panel, Federico Moreno Nickerson, director of product development at Classic Vacations, told attendees that "Mexico has a huge advantage in terms of the value proposition" over competitors such as Hawaii and the Caribbean. "You don't advertise that it's safe to travel to Mexico, but you do send messages that offset all the negativity," he added. "It's about learning that Cancun for a couple of weeks had a record number of international arrivals, and how many millions of visitors continue to visit Mexico." The new Consejo marketing campaign in the U.S. goes a long way toward addressing that, he added. "I personally have never been so connected to an ad campaign," said Nickerson. 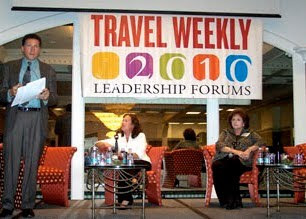 Other tour operators participating in forum panels this year included Tim Mullen, co-president of Apple Vacations; Jack Richards, president and CEO of Pleasant Holidays; Colette Baruth, vice president of marketing, Mexico and Latin America at Gogo Worldwide Vacations; Elizabeth Moriarty, vice president of product development at MLT Vacations; and John Hanratty, chief marketing officer for Travel Impressions. Addressing technology and online marketing issues were John Farrell, Google's country director for Mexico; Peggy Bianco, group vice president of global hotel sales at Orbitz; Bryan Estep, vice president, Latin America and Caribbean at Travelocity; and Javier Escobedo, general manager for Latin America at Hotels.com. A presentation on "The Emerging American Consumer" was also given by Peter Yesawich, chairman and CEO of research firm Ypartnership.